Your PC's grab a hold of an ancient chain & your party is transported a world away to adventure! So begins the TSR classic G2 Glacial Rift of the Frost Giant Jarl by Gary Gygax the second in the Against the Giants line of adventures. 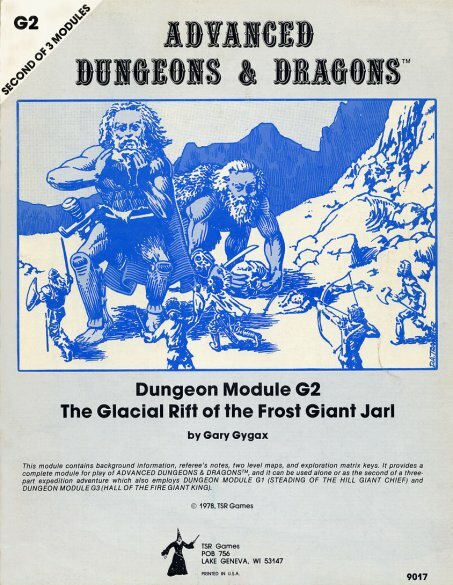 This is isn't the first time that I've talked about using G2 Glacial Rift of the Frost Giant Jarl by Gary Gygax with adventurers & super heroes. 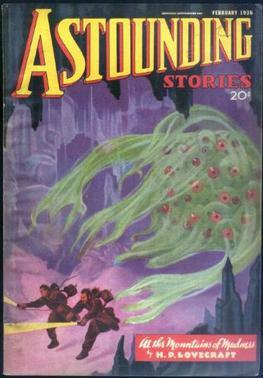 But any of the 'G' series of adventures which are a part of the mega adventure Against The Giants is a weird proposition in a pulp or golden age super heroes style campaign . I've adapted them to all kinds of D&D based games & retroclones before. I'm going to keep the Lovecraft circle route here but bring it into a far further into the veil of our world.The ice giants lead by the Jarl Grugnur and emissaries have settled into the former ruins of an Antarctic outpost of the Elder Things. The whole adventure is taking place at the extreme edge of the world because of the use of the ancient Elven gateways to Fairyland there. Some of the first creations of the Elder Things might actually have been the Elves of Europe at the very tale end of their existence. One such Otherworld gateway is/was under the direct control of Gwyn ap Nudd from Welsh folklore. "Gwyn ap Nudd (Welsh pronunciation: [ˈɡwɨn ap ˈnɨːð], sometimes found with the antiquated spelling Gwynn ap Nudd) is a Welsh mythological figure, the king of the Tylwyth Teg or "fair folk" and ruler of the Welsh Otherworld, Annwn, and whose name means “white son of Nudd”. Described later on as a great warrior with a "blackened face", Gwyn is intimately associated with the otherworld in medieval Welsh literature, and is associated with the international tradition of the Wild Hunt"
Gwyn ap Nudd is intimately associated with Lludd Llaw Ereint, "Lludd of the Silver Hand", son of Beli Mawr, all of these family members are of bloodline belonging to the Lovecraftian Chaos deity Nodens & his other masks as " the Roman gods Mars, Neptune and Silvanus, and his name is cognate with that of the Irish mythological figure Nuada and the Welsh Nudd." All of this ties directly into King Arthurs Welsh adventures with giants of legend but both Arthur and Gwalchmai fab Gwyar have run ins with some nasty pieces of work. The fact of the matter is that our world even in the early Twentieth century isn't ideal suited for Jotun anymore. Law is on the up stroke & the era of the gods of legend is over. The time of the Jotunn is done or so it would seem. "In Norse mythology, the Jotun (jötnar in Old Norse, a cognate with ettin) are often opposed to the gods. While often translated as "giants", most are described as being roughly human sized. Some are portrayed as huge, such as frost giants (hrímþursar), fire giants (eldjötnar), and mountain giants (bergrisar)." The Hrímþursar are alien creatures whose Glacial rift is a completely artificial ecology of Fairyland and its an artificial construct that is another outpost into our world. G2 Glacial Rift of the Frost Giant Jarl by Gary Gygax is a scouting mission to access the situation for a full on invasion of our world. But even with upper level adventurers from Troll Lord Games Amazing Adventures! rpg line or Adventurer,Conqueror, rpg The Barbarian Conquerors of Kanahu I highly doubt the PC's will survive?! What?! There are some extremely deadly monsters scattered throughout this classic adventure that are more then capable of slaughtering even upper level adventurers. The giants are deadly opponents of the most extreme variety. The main forces of the ice giants are ogres who are ideally suited to the extreme conditions that the adventurers find themselves. 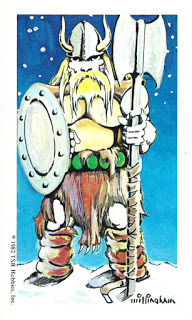 G2 Glacial Rift of the Frost Giant Jarl by Gary Gygax is a module that might as well take place in the realms of mythology. The PC's are dipping directly into the affairs of the gods here. The whole place is crawling with yeti, frost giants, ogres, & winter wolves. Not to mention the the prison that contains an attractive storm giantess. Storm giants are royalty of the Jotun. Holding a Jotun royal for ransom is a very risky proposition. Throughout this blog entry I've been using the Lion & Dragon rpg retroclone as a sort of mythological framework & OSR structure. I haven't talked about this but its there none the less. Using some of the occult ideas from Dark Albion, Lion & Dragon, & Cults of Chaos its possible to build upon & out some of the old school classic elements presented G2 Glacial Rift of the Frost Giant Jarl by Gary Gygax as an actual frame work for a pulp style game even for a modernish setting. The ideas of these products can help to flesh out some of the more esoteric elements presented in the Against the Giant series.